We’d love your help. Let us know what’s wrong with this preview of Faerie Killer by Emma L. Adams. Short story exclusively for newsletter subscribers. This was a fairy tale, all right. Just not the pleasant, happily-ever-after type. I’m Ivy Lane, and this is the story of how I became known as the faerie killer. Ever since the faeries destroyed the world as we knew it, I’ve been a captive of an evil Sidhe lord, trapped in his realm with a hundred other human prisoners. I’m Short story exclusively for newsletter subscribers. ​I’m Ivy Lane, and this is the story of how I became known as the faerie killer. Ever since the faeries destroyed the world as we knew it, I’ve been a captive of an evil Sidhe lord, trapped in his realm with a hundred other human prisoners. I’m lucky to still be alive after this long. To ask other readers questions about Faerie Killer, please sign up. Short-ish Novelette about Ivy, who's been trapped in Faerie for three years. 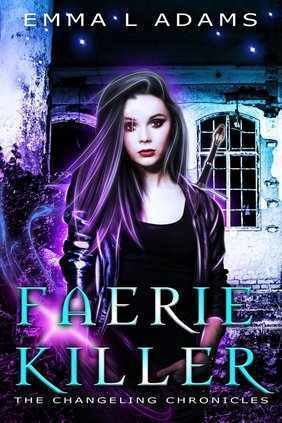 The story of Faerie Killer encompasses just a few days in which she's trained to kill the faerie king who kidnapped her, along with many others from her hometown. I wish I could tell you how long the novelette is, but as I got this, apparently ARC version of the story, for joining Ms. Adams' mailing list, I can't find that information. Nonetheless, this was an enjoyable, YA fantasy. This was a great story! With action and excitement! Great to get the story of what happened in Faerie and how Ivy gained her powers.